Gotham Comedy Club invites you to perform at a New Talent Showcase. Whether you have been doing stand up for several years or you're just starting out, Gotham wants you to start your career with the best. Take the stage of where Jerry Seinfeld, Dave Chappelle, Lewis Black have performed. Gotham was featured on NBC's Last Comic Standing and is home to the Comedy Central's TV Series "Live at Gotham". 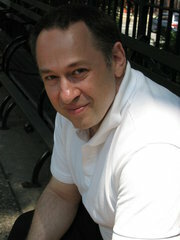 Andrew Engel has been an established comedy producer in New York City for the past 19 years. Over the past 19 years, his New Talent Shows have become the premiere showcase for discovering and developing new comedic talent in New York City. These shows have become a rite of passage for many serious young comics in New York City. Many national headliners started as new talent on his shows including, Jim Gaffigan, Ed Helms, Greg Giraldo, Demetri Martin, Mike O’Malley, Lisa Lampanelli, Judah Friedlander and many others. Headliners who often drop by his New Talent Shows include: Jerry Seinfeld, Louis CK, Dave Chappelle, Jon Stewart, Chris Rock, Lewis Black, Ray Romano, Rosie O’Donnell, Colin Quinn, Sherri Sheperd, Joy Behar, Robert Klein, Denis Leary, Caroline Rhea, Darrell Hammond, and many others. He has developed relationships with many comedy gatekeepers over the years who often ask him who they should see. He often puts together industry showcases for them as well. Recent attendees include representatives from: Comedy Central, HBO, Apostle pictures, CAA, ICM, William Morris Endeavor, Three Arts, Late night with Jimmy Fallon, The Late show with David Letterman, The Montreal Comedy Festival, The SXSW festival and many others. Andrew has also produced countless other comedy themed shows including “Funny Business” which combined A list comics performing alongside corporate CEOs such as Carl Icahn, Barbra Corcoran, Donny Duetsch, Jerry Della Famina, Jim Lebenthal and many other titans of industry. "I have been participating in Andy's New Talent shows for over 10 years now, first as a bringer and now as a guest. What keeps bringing me back are the enthusiastic audiences and quality of shows. Andy is the best at this stuff." "Andy was the only person I would trust to showcase a young comedian who wanted to take their career to the next level." To read some other testimonials Visit the school’s website at www.manhattancomedyschool.com. Andrew founded and owns the Manhattan Comedy School, which is the official school of Gotham Comedy Club, where he also produces shows.